Baltimore County Councilman David Marks announced on Wednesday that he would be introducing legislation at the February 20th legislative meeting that would amend the county charter to create a Department of Transportation and Infrastructure. The new agency would replace the current Department of Public Works. 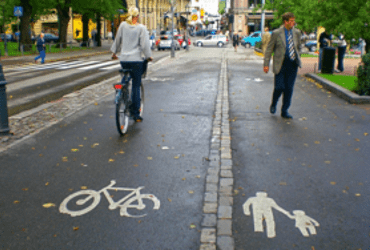 Under the change, the Department of Transportation and Infrastructure would have a expanded mission of promoting bicycling, pedestrian features, and transit where appropriate. “This proposal will help steer Baltimore County toward a more multimodal transportation system,” said Nate Evans, past executive director of Bike Maryland and a member of the Baltimore County Pedestrian and Bicycle Advisory Committee. ​Before his election in 2010, Councilman Marks worked in senior positions at the state and federal departments of transportation. He sponsored the legislation that created the Baltimore County Pedestrian and Bicycle Advisory Committee, helped secure funding for new bike lanes in Towson and a trail in Perry Hall, and worked with the Maryland Transit Administration on a feasibility study for a Towson circulator. A copy of the proposed legislation was obtained by NottinghamMD.com and is available via the link below.